World Water Day March 22nd! World Water Day OFG Challenge! 1) Change regular sprinkler emitters to Hunter MP Rotators: Each emitter only costs around $5 and is 40% more efficient than regular spray emitters. Available at your local irrigation supply or Home Depot. 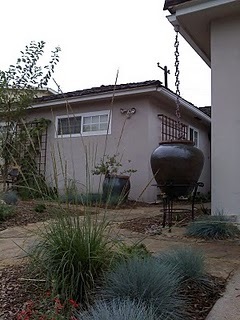 2) Remove unnecessary lawn: Replacing water thirsty turf in your front garden or parking strip with drought tolerant and native plantings can reduce your water use by 70% or more and eliminates the need for water polluting fertilizers and other chemicals. 3) Replace one or more downspouts with a rain chain and rain barrel: 1″ of rain can generate several hundred gallons of water coming off of your roof, save that water and re-use it in your garden at a later time! 4) Mulch your planting beds: Mulching your plants with a shredded mulch helps to soak up rain, prevents plants from drying out as fast, and helps improve soil condition by allowing it to take in more water. 5) Build a dry stream: creating dips and swales in your garden that allow water to sit and soak in reduce the amount of water pollution generated during rain storms and save water use in the landscape by creating a “water bank” in your garden’s soil. 6) Tell a neighbor about the OFG program and how simple changes can make a huge difference in preventing water waste and pollution. Visit our World Water Day site for more tips and information!